I sew. No really, I do. I have a pretty nice Janome machine that I drive like a race car (ZOOOOOOM! ZOOOOOOOM!). Thank god I can’t get a speeding ticket in the attic.I used to sew elaborate things like Elizabethan gowns. Or sometimes less elaborate things like suits. And maybe the occasional skirt. One time I made a duvet cover. That was horrible, just horrible. So what have I made recently? 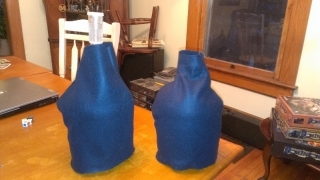 Carboy coozies.Yes. You read those two words correctly. Why? 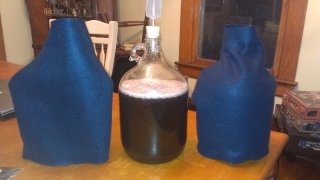 Because Chad’s beer needs to be kept dark and happy. Yeah, I know what you’re thinking. That is a fine piece of sewing right there. A fine piece of sewing indeed. 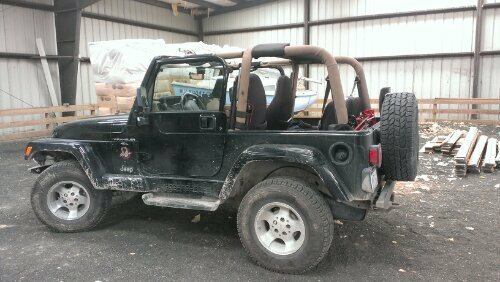 Thursday it was 82 degrees and I was stuck with the hard top on my Jeep. I was obviously anxious to be done with the hard top and get my new fancy Bestop Supertop NX slapped on Edmund so that’ll I too could take advantage of the super weather. Friday it was 70 or so for a while, until the temps plummeted 20 degrees in five minutes. And Saturday, the day I was scheduled to drive to Fairmont and put the hard top into storage. Well it was a balmy 35 degrees when I rolled out of bed at 8:30. Yep. THIRTY-FIVE DEGREES. I’ll let you digest that for a few minutes. Ok. You’ve probably figured that 35 degrees is not a great temperature. And I concur. But I’m also going to throw this out…the wind was crazy. It was pushing and shoving things all over. Like, for instance, my Jeep as Bj and I drove down mighty I-79 to drop the hard top off. So 35 degrees plus whatever crazy arse windchill = a poor day to change to the soft top. Oh, did I mention that the soft top was still sitting in its box in my foyer in Morgantown? Well it was. Because it needed assembled before I could install it. By the time we got to Fairmont it was a stunning 44 degrees. The sun was out, the sky was clear, the wind was still wreaking havoc. And there we were, in a vehicle with no top. Yep. Now, the smarter of the two siblings had a parka, gloves and a wind proof polar fleece hat. The other was wearing a hoodie and a baseball cap. I’m not going to name names, you’ll have to figure out which was which. The worst part of driving the 30 minutes between Bunner Ridge (which is where we actually had dropped the top off) and Morgantown? We did not see a single Jeep. What a wasted opportunity to pull the “We are so much cooler than you because we are out running around with no top on the vehicle when it’s only 44 degrees.” card. I was so disappointed. Tragic. Just tragic.